The Tesla Model X, which is the first electric car with a significant towing capacity, reportedly can tow at impressively high-speeds. 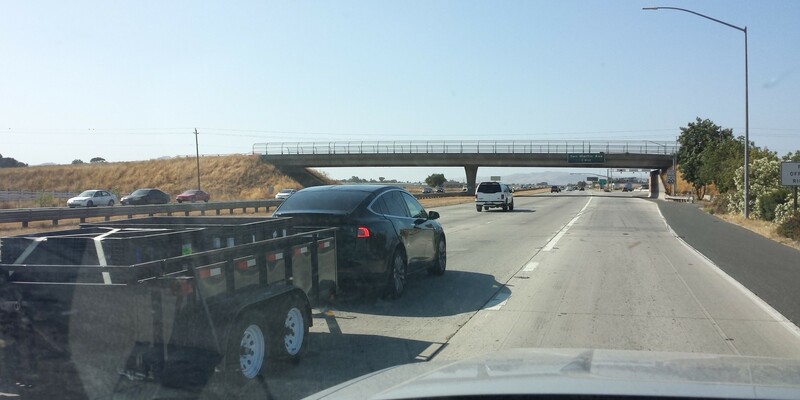 Trip Chowdrhy, a financial analyst who covers Tesla for Global Equities, says he witnessed Tesla testing a Model X towing at “very high speeds” at the Fremont factory. When configured with 22″ wheels, the Model X has a towing capacity of 3,500 pounds and when configured with 20″ wheels, the towing capacity of Model X increases to 5,000 pounds, according to Tesla. A 5,000 pounds capacity can enable the use of a variety of different trailers and it’s interesting to hear that it can work at high-speeds, though some jurisdictions have speed limits for vehicles with trailers – for example in California where there’s a 55 mph limit.